Do you have a child that loves art and enjoys working with different art mediums? What if they had the ability to not only draw something but to actually draw it three-dimensionally? To create a drawing that they can see and touch from all sides. They might think that’s pretty awesome, right?! Well then, 3D art pens would be a great art medium for them to try! Maybe you are like me and hadn’t heard about 3D drawing pens until recently. But now that I know about them I’m seeing and hearing about them all around. In fact, I noticed a couple of weeks ago that a local fine art academy is offering a class for children specifically for 3D art pen drawing. I think that shows that this art medium is catching on and people are interested in learning how to use it and create with it. 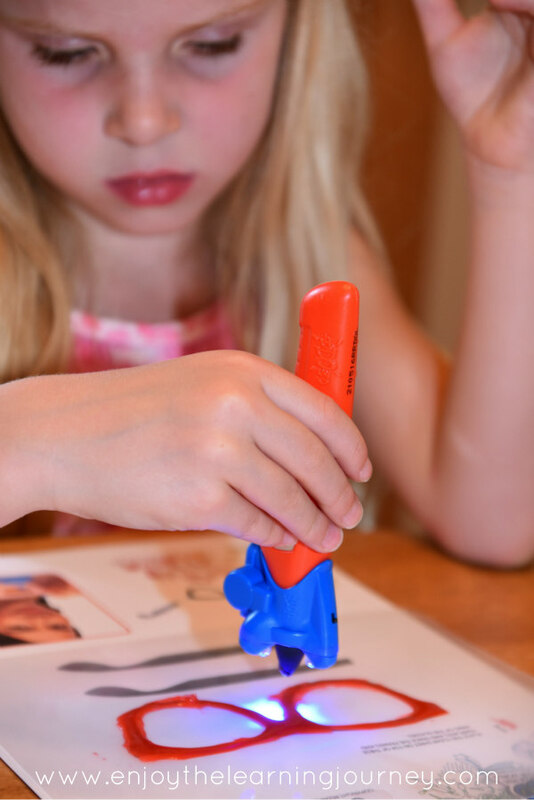 IDO3D Vertical pens are perfect if your child is interested in learning 3D drawing. The kit is affordable and available at many different retailers, including Amazon, Walmart, Toy R Us, Target and more. 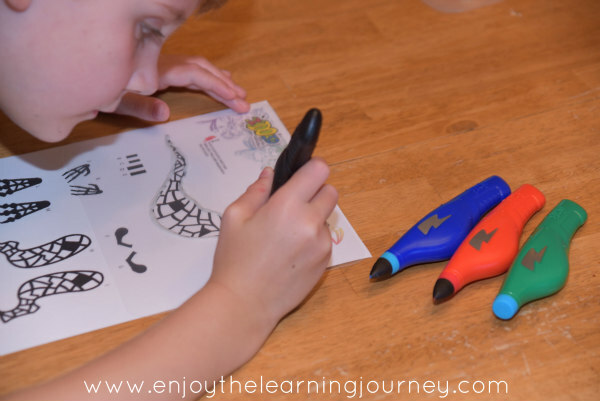 The kit comes with everything you need including different color pens, instructions and project ideas. In our IDO3D Vertical kit we received 5 colored pens, 1 LED light that can be transferred between pens, a clear non-stick sheet, and a guide map with project ideas. 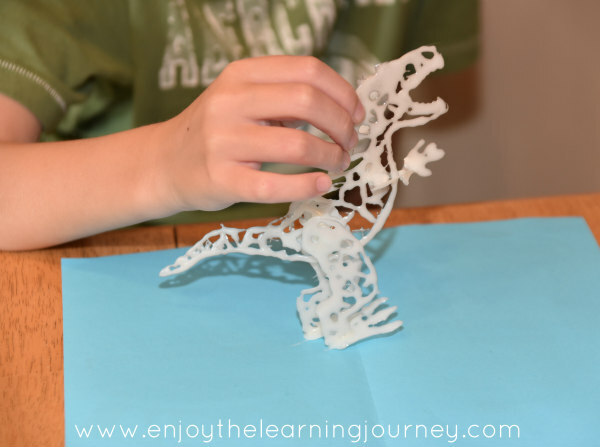 After we unpackaged everything and looked at the 3D projects included, we decided to go to the IDO3D website to see their additional 3D project offerings and the kids were pleased to see more options. They looked at all of them and then each made their decision on what they wanted to create. But before they began those projects I suggested they practice with the pens first. The IDO3D website includes how-to videos so we watched those and then Kellan began to draw his first 3D cube. It started out a little shaky. Within the first 2 minutes Kellan was frustrated and ready to give up. Not having used anything like this before it felt uncomfortable to him. I encouraged him to keep at it and take it slow. Once Kellan felt comfortable using the pen he decided to put his own flair into the cube and added decorative sides to it. Note: When drawing flat the light stays off until a portion is completed and then the LED light is turned on the cure (or dry) it. When drawing into the air, keep the LED light on and just start bringing the pen up. After he admired his cube and was ready for a bigger project, I printed the 3D project he chose from the IDO3D website. I then put the clear drawing sheet over it (in order to peel the project off the paper), taped the pieces to the table in order to keep it from moving around and then Kellan began tracing. The clear sheet didn’t cover the whole page so once he was done with the body of the dinosaur we peeled it off and moved the clear sheet so he could then complete the legs and feet. Once Kellan had all the pieces of his dinosaur complete he then began to piece the dinosaur together. 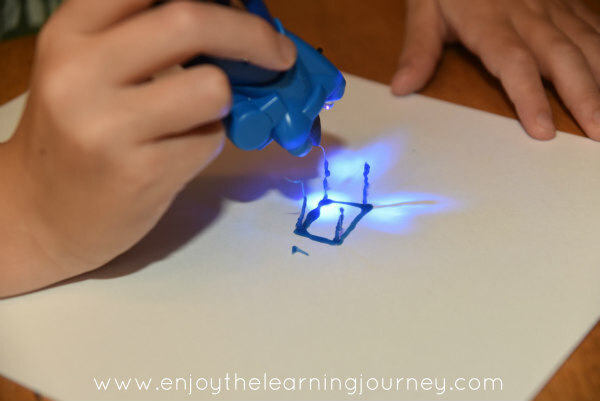 The pen’s polymer ink acts as an adhesive so you just add a little ink to where you want the pieces glued, put them in place and then cure the ink with the LED light. The pieces stay together! And here is Kellan’s finished T-Rex! 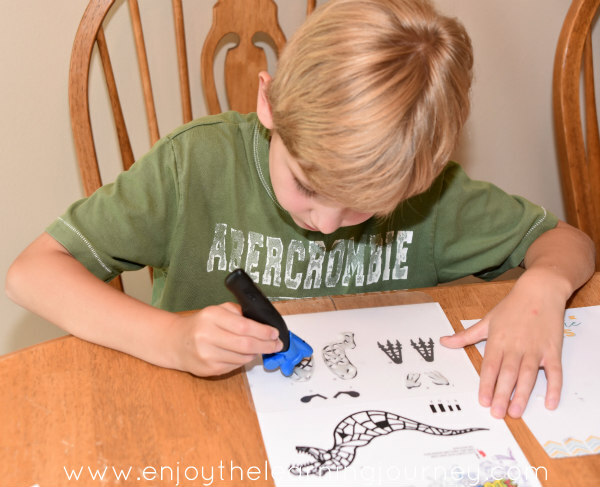 Now that Kellan has has some practice and knows how to use the pens he can certainly create his own three-dimensional drawings. Completing the practice cube and one of the IDO3D projects was a wonderful way for him to get used to how it works so if your own child is just starting out I’d recommend doing that first. Then after they have gotten the hang of it they can create a preprinted drawing. And then after that create their own. 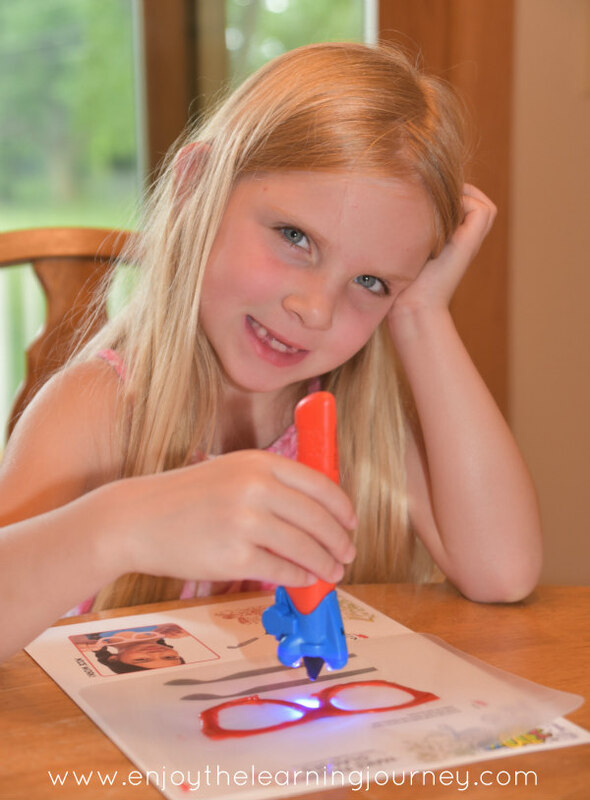 This may cut down on any potential frustration as they learn how to use this art medium. 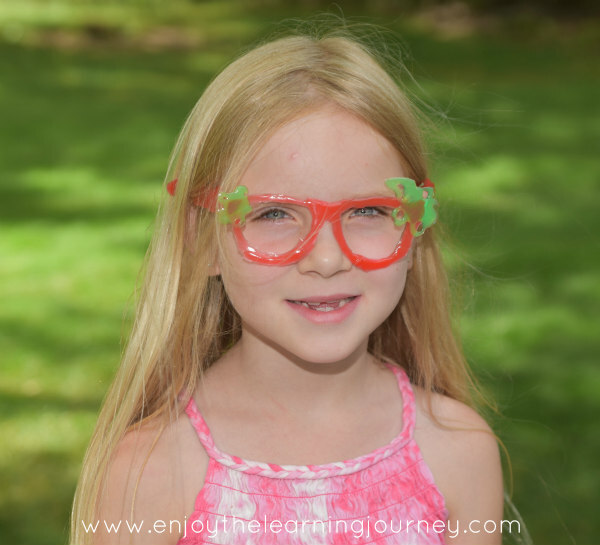 She loved how the glasses turned out. They stayed a little sticky though so when the wind blew, her hair would stick to them. It was just a minor annoyance though and she still enjoyed them and was proud of her creation. It takes patience to use the 3D pens but they really can be a lot of fun. And I envision using them in our homeschool to make connections with what the kids are learning. Maybe make a model or draw something related to a theme we are working on. 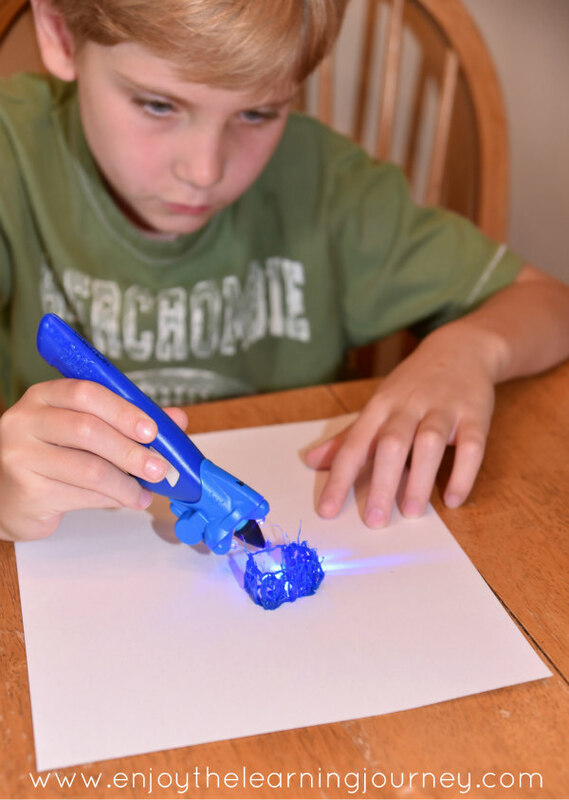 How old do you have to be to use the IDO3D Vertical 3D art pens? 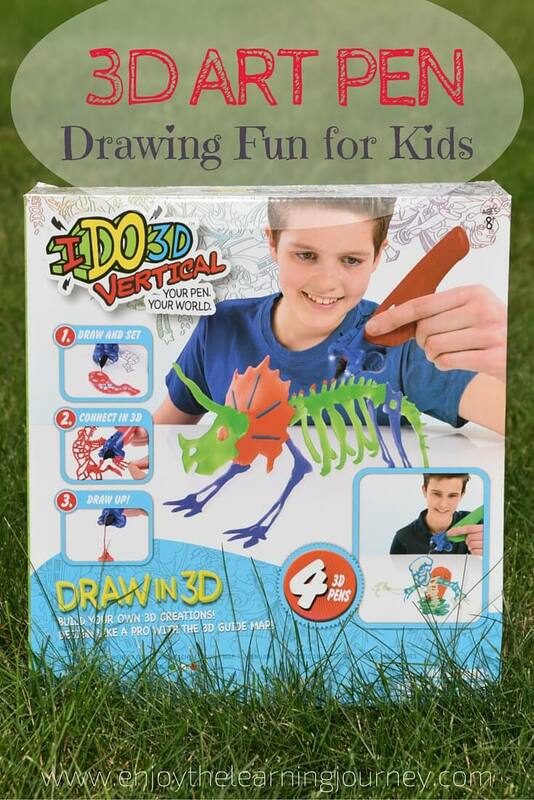 IDO3D is recommended for children ages 8 and up and I would agree with the age recommendation unless you are willing to help your child quite a bit. Kellan (age 8) was able to complete his project with almost no help from me. He only needed an extra hand when he put the pieces of his dinosaur together. Jenna (almost 6) needed a lot more help from me. She was able to complete the project but only with assistance. IDO3D offers online 3D art classes so if your child wants to learn but is struggling or if they want to advance their skills then this might be a good option for them. For more news and information, be sure to follow IDO3D on Facebook / Twitter / Pinterest / YouTube / Instagram. And you have a chance to win a IDO3D Vertical kit! 3 winners will be chosen. Giveaway ends at 10pm CST on August 3rd, 2016.